Pothos (Scindapsus pictus): growing, planting, caring. The pothos, also called the devil's vine or devil's ivy because it is almost impossible to kill! Scindapsus pictus - the pothos or money plant - is a species of flowering plant in the Araceae family native to French Polynesia, and a popular houseplant in temperate regions. It is an evergreen vine growing to 20 m (66 ft) tall in its natural habitat but in containers it stays much reduced, with stems climbing by means of aerial roots which adhere to surfaces. The leaves are alternate, heart-shaped, up to 100 cm (39 in) long with juvenile leaves much smaller, typically under 20 cm (8 in), especially when it is cultivated as a potted plant. The flowers are produced in a spathe up to 23 cm (9 in) long. The genus Epipremnum aka Scindapsus aka Pothos is composed of 8 species of which two are known among us: E. aureum and E. pictum. They are evergreen climbers whose leaves have two shapes: young and adult. The stems are radicant and can re-root away from the original foot. The leaves are whole or pinnate, alternate. The flowering is composed of flowers without petals surrounded by spathes. After the purchase do not wait too long to transplant your pothos into a new pot matching the size of the mound, with a 1 meter-high stake. Fill it partially with soil and potting mix, plant the pothos and then its support and add the rest of the mixture until filling the pot. Tamp well and water until water comes into the cup under the container. During the growing season, water once or twice a week. In winter, space the waterings to 10 days. 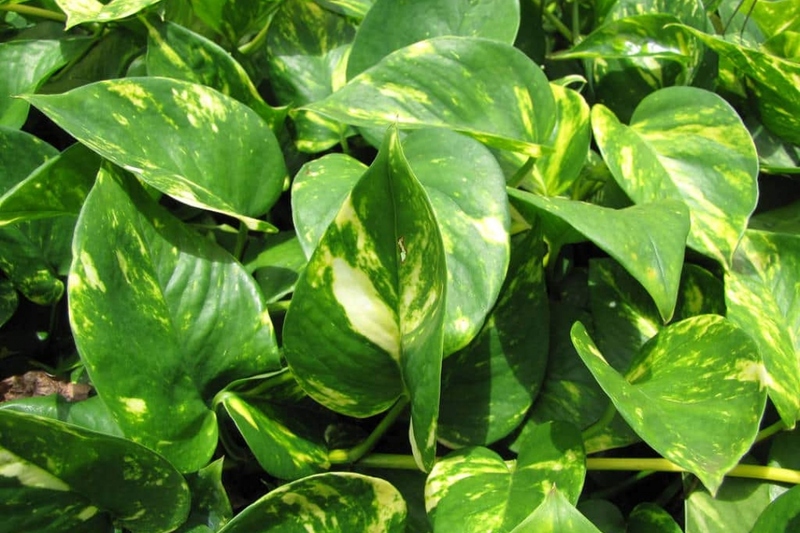 From time to time, clean the leaves of your pothos with a damp cloth, to prevent the attacks of red spiders and remove the dust that impeeds the photosynthesis. In March, shorten all stems 1/4 of their length. From March to June you can try to propagate your pothos simply by marcotting them. So lay one or more stems against the soil of the pot and wait several weeks for them to form roots. You will only have to take the new plant to repot it elsewhere! Watch for the attacks of red spiders and mealybugs, which you can remove with a damp cloth. If temperatures are between 18 and 25 ° C take out your pothos for sunny days. As soon as the temperatures drop, bring in your pothos! Be sure to keep it at a temperature that does not drop below 14 ° C, but do not place it near a radiator either.